In Part 1 of my review, I discuss why I decided to do a juice cleanse, the pros and cons of BluePrint Cleanse, and my experience testing the limits of their customer service. The verdict is in: BluePrint Cleanse is a good baseline experience for beginners. But how exactly did the juices change my health? After seeing how popular BluePrint was, I decided a taste test was in order. BluePrint recently began selling its juice retail at Whole Foods, so I bought one of each flavor to try. 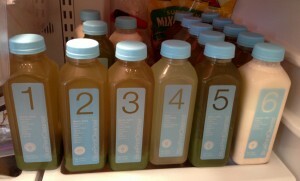 The most important one was their green juice, because I knew I wanted to do the most advanced level cleanse which was four bottles of green juice per day. It was surprisingly tolerable, even refreshing. I was game. All three BluePrint cleanses I did were the three-day Excavation Cleanse, with four green juices, one spicy lemonade, and one cashew milk per day. The other levels, Foundation and Renovation, have less green juice and more fruit juice. I’d followed BluePrint’s preparation instructions to phase out meat, sugar, dairy, and processed foods for three days before the cleanse, so I wasn’t too hungry and did not experience a crash. I had four bowel movements throughout the day, each one smaller than the last. I drank the juices approximately one hour apart, as recommended. I had to urinate pretty frequently, so I did not drink much water or herbal tea between juices, though it was suggested to stay hydrated even between juices. By 7:30 PM, I was hungry, so the cashew milk was a godsend. After I finished the cashew milk, I suddenly felt extremely tired. I went to bed three hours early. I woke up around my usual time and had a very small bowel movement, the only one of the day. I felt sleepy mid-afternoon but kept myself alert by watching some TV. I started to worry that I was constipated so I did some rebounding at night, which didn’t help. Again I was hungry at dinner time, so the cashew milk helped. I was able to stay up until my usual bedtime. At this point, feeling confident that I could handle it, I decided to extend my cleanse from three to five days. 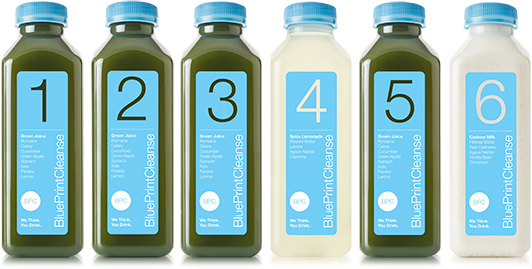 It was too late to order more juice from BluePrint, so I ordered a two-day cleanse from Ritual Cleanse. Their Classic Reset Cleanse was the same exact format as the Excavation Cleanse, with nearly the same ingredients. I started having better energy throughout the day. I realized I was getting bored with drinking the same juices over and over, so I bought a couple pineapple-apple-mint juices from Whole Foods to add variety. BluePrint allows for additional juices if the prescribed six are not enough. Today was a breakthrough with my body’s digestive efficiency: [TMI alert] Around noon, what I thought was some gas suddenly came out as poop right in my underpants. After getting over the initial shock of soiling myself for the first time in conscious memory, I realized it was a good thing. I was like a baby who drinks liquid nourishment and poops it out soon after. Like baby poop, it didn’t stink much. Throughout the rest of the day, I literally had to run to the bathroom 2 or 3 more times. The urge would come so randomly, I was grateful I had cleared my schedule. From this point forward, it was green bits in the toilet. My digestive system was so cleaned out that the juice was exiting my body only 30 minutes or so after drinking. I really started to miss food. The juices from Ritual Cleanse arrived on my doorstep early in the morning. Unfortunately, I disliked the taste of their green juice. Too much kale, I think. Then I made the mistake of going grocery shopping with my husband. As I walked around the market, I started to crave all sorts of food. Ritual Cleanse’s version of cashew milk was more gritty than BluePrint, and I found it hard to finish because it did not taste good to me. It got really hard to drink the green juices from Ritual Cleanse. I was down to my last four bottles of green juice, but I only got through them by interspersing sips with the pineapple-apple-mint and Ritual Cleanse’s beet-carrot-apple-pear pre-shred (very yum). Since I was drinking extra juice so that I could force down the green juice, I wasn’t hungry enough to drink the last cashew milk at the end of the day. As for bowel movements, I continued to have to run to the toilet suddenly, around four to five times during the day. As before, it was only small amounts of green bits. I missed food terribly and was looking forward to chewing again. I lost five pounds, which was in line with typical juice fast weight loss of one pound per day. My skin seemed more clear, but I was more relieved that I did not break out, a common detox symptom. My inflammation decreased; I could see some swelling on my forearms had gone down. Energy levels were great and I felt clean from the inside out. BluePrint recommends the three days post-cleanse to consist of the same diet as pre-cleanse: salads, steamed veggies, small amounts of brown rice or sweet potato, and fruit. Meat is not allowed until the fourth day after cleansing, and only then in small amounts. I followed the guidelines, breaking my fast with fruit, avocado, and a spinach salad. It didn’t take much food at all to feel full. I waited until the fifth day post-cleanse to eat at our favorite Persian restaurant (chicken koobideh, mmm). It gave me something to look forward to as I wrapped up the cleanse. On my second cleanse before the holidays, I felt more deprived than anything. I didn’t lose as much weight and remember having intense cravings for meat. Watching raw food show episodes and smelling my husband’s food did not help. On the plus side, by Day 2, I was having to run to the bathroom with liquid poop. Having that happen earlier than last time told me that I maintained a decent level of “clean eating” after my first cleanse. On my third cleanse after the holidays, I banished my husband to his office upstairs during meal times. That helped immensely, along with avoiding grocery stores and pictures of food. Again, the weight loss was not dramatic, but I was more concerned with detoxing and cleaning out my system. Three days without solid food felt easy, like an old familiar routine. By far, the biggest benefit of juice cleansing has been the elimination of cravings. After each cleanse, my cravings would decrease a bit more. My biggest weakness is sweets, followed by salty/savory snacks, and meat. I used to eat mindlessly in front of the TV after dinner, even when I was full. Completing the cleanses reinstated my sense of self-control and broke the pattern of emotional overeating. I realized how much I’d changed a couple weeks ago when I was extremely distraught about something and I didn’t think about eating sweets at all. Before, I would have stuffed myself with cookies, ice cream, whatever was in the house. 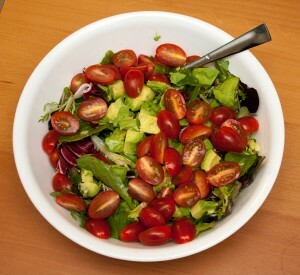 Now, I feel satisfied with a big salad and a few dried dates for dessert. It will seem a daunting task at first, but the results are worth it. The benefits of juicing go far beyond the physical or even the emotional. Resetting my eating habits and relationship to food has spilled over to other parts of my life, inspiring me to pursue a plant-based diet and anti-inflammatory lifestyle. Whether you buy the juice commercially or make your own juice, I believe a juice cleanse of any length will be a step toward optimal health. 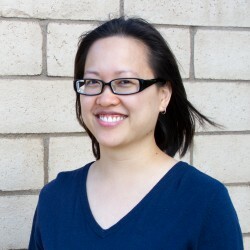 If you do decide to try BluePrint Cleanse, please put my email address as the referral: chanlee[at]cutevegetables.com (case-sensitive). Congratulations! Very helpful testimony. Would like to try it for the benefits.